This is my favorite look in the series! You could say that I saved the best for last!! I have been dying to show you guys(naturally I did this a few weeks ago). I really hope you guys like this!! 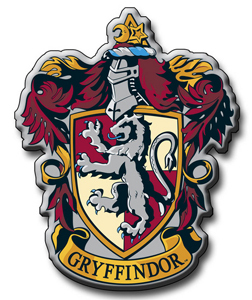 Also, just out of curiosity, are there any Gryffindor's that follow me? Don't forget to check out the other House Looks! Cool look, I love the quality of your pictures, I know it's not easy! Beautiful look and the lipstick really adds something extra to the look! Love this look! you look gorgeous!! And I'm from Gryffindor! This look is on FIRE. I LOVE IT!!! Part-Ravi, part-Griffy *raises hand* Amazing make-up, probably my fave colours to work with of all time: red, gold, orange and black. You rock it, gurl! My best friend is from Gryffindor! Thank you! That is so awesome! Thank you so much Christel! AHH this is fantastic, especially against your piercing blue eyes! BRAVO! Thank you so much Phlox! !